NOVEL CHATTER: 45 years ago today Dark Shadows made its debut! Instead of our usual Monday Books to Movies post, I'm posting about the 45th Anniversary of the show Dark Shadows. It was ground breaking, in so many ways! It changed the demographics of daytime television and it forever changed the way we look at vampires. Dan Curtis changed it all. The vampire as a trapped victim. 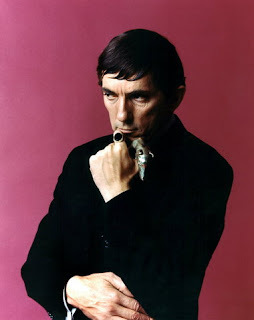 Barnabas Collins...ahhhh ... played by the wonderful Jonathan Frid! AND....we know that Johnny Depp bought the rights to Dark Shadows on the death of creator Dan Curtis. Depp and his Gothic collaborator Tim Burton are currently filming the remake in the UK.